March for Science This Saturday, April 22 at 2:00 p.m. The March for Science organizers released the march route and schedule today. They plan to start the march near the Washington Monument and march along Constitution Avenue to the U.S. Capitol. The organizers have a whole-day affair planned , but if you just want to come to the march, that's in the afternoon. The organizers would like to get an idea of how many people are coming, so please register here. NTEU members meet at 1:30 p.m. at the corner of 14th Street and Jefferson Drive, S.W. for a group photo. Click for directions. NTEU members are meeting at 1:30 p.m. on the southwest corner of Jefferson Drive and 14th Street, S.W. near the Capital Bikeshare station. We'll assemble at 1:30 for a group photo. Please be on time so that you can be in the photo. At 1:50 p.m. we'll walk down to the March start, which is at the corner of 15th Street and Constitution Ave., N.W. The march starts at 2:00 p.m.
You can find more details on the March for Science's website here. Now is not the only time that an administration has been hostile to clean water, clean air, science, and cleaning up toxic messes. During the Reagan administration we also suffered attacks, budget cuts, and overall hostility from our political leadership to the EPA's mission. But we survived and continued protecting human health and the environment after the end of the administration. To cheer up your Friday, here are a couple photos from the archive of some of the dark-humor t-shirts of the day. A common reference at the time to Administrator Anne M. Gorsuch, who was cited for contempt of Congress for refusing to provide agency records to Congress. A list of political appointees who did not survive the administration and a reference to one of Ms. Gorsuch's quotes. According to a 1983 Washington Post article, "EPA employees say their shirt, which originated in the agency's Denver regional office, is a hot item among the agency's career staff, and its popularity has spread to other quarters as well. 'We've had requests from the Hill and the White House, usually through some other organization,' said Mike Burns, an employee in the EPA's hazardous-waste division. 'I guess they don't feel comfortable just calling up and asking for one.'" If you have any similar humorous historical photos that might help folks cope with looming cuts and attacks on the agency's mission, please feel free to send them to info@nteu280.org and we'll try to post them. Our sister union, AFGE Local 3331, is jointly sponsoring a rally to save the environment with the Sierra Club outside EPA Headquarters. NTEU is supporting AFGE in this rally and encourages you to use your lunch time to attend. Rally takes place from noon - 1:00 p.m. tomorrow, Wednesday, March 15, outside the WJC north & south buildings on the 12th street side. Wear your NTEU Chapter 280 t-shirt, if you have one! Any time in excess of your normal lunch period is considered non-work time and should be accounted for through leave, credit hours, or other absence time. NTEU Chapter 280 and AFGE Local 3331 are jointly sponsoring a "Lunch & Learn" presentation on the First Amendment Rights of Federal Employees. Our keynote speaker is Jeff Ruch of Public Employees for Environmental Responsibility (PEER). Jeff is the Executive Director of PEER and an attorney with expertise in federal First Amendment rights. We'll cover social media, talking to the press, and publicly discussing what you know as an EPA employee. We know many of you have been concerned about what you can and cannot say in the new administration. Bring your lunch and find out! The rules are different for attorneys and non-attorneys. We intend to cover this distinction as part of the presentation. We hope you'll bring your lunch and join us for this important event. Please RSVP by clicking this link and entering your information. Space is limited in the room and will be filled on a first-come, first-served basis, with priority to those who pre-register. This Lunch & Learn presentation is a joint presentation of AFGE Local 3331 and NTEU Chapter 280. EPA has five different unions, all with its own leadership, something that the New York Times incorrectly overlooked in a recent story. The unions at EPA include the National Treasury Employees Union (NTEU), the American Federation of Government Employees (AFGE), the National Association of Government Employees (NAGE), the Engineers and Scientists of California (ESC), and the National Association of Independent Labor (NAIL). Each of these five unions is organized differently, some with "chapters" and some with "locals." The authority of chapters and locals varies according to the constitution and bylaws of each union. NTEU Chapter 280 represents "professionals" at EPA headquarters. Put another way, we represent all people who have a job that requires positive education. If your job requires that you have a degree, you're in the NTEU Chapter 280 bargaining unit, although not a member unless you join. If your job does not require a degree, then at headquarters you are in the AFGE Local 3331 bargaining unit, even if you have a degree. The test is whether or not your degree is required by your job. At EPA headquarters, therefore, there are two unions: NTEU Chapter 280 and AFGE Local 3331. The NY Times story incorrectly reported that the AFGE Council President represented all EPA employees. This is wrong. Mr. John O’Grady, a biochemist in EPA's Region 5 office and President of the AFGE Council at EPA, only represents AFGE bargaining unit employees. The Times story overlooked all the employees represented by NTEU, NAIL, NAGE, and ESC. At headquarters, NTEU Chapter 280 represents approximately 1700 professionals. Nationwide, NTEU represents even more. We expect more from the NY Times. We hope the Times runs a correction of this error. EPA Security has been notified that there will be a three day international delegation meeting held at the Mellon Auditorium with other federal agencies, from Monday November 21, through Wednesday November 23, 2016. Appropriate authorities will implement additional security measures at the William Jefferson Clinton (WJC) East building. This will also include increased security presence in the Federal Triangle area. 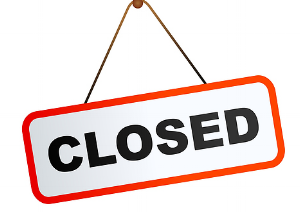 •	The WJC East employee entrance under the archway adjacent to the Mellon Auditorium will close at 2:30pm on Monday November 21, 2016 and remain closed all day Tuesday and Wednesday. •	With ongoing GSA rigging operations (i.e. fencing) in between the WJC East building and the Ronald Reagan building, this closure will likely require employees trying to gain access to the WJC East and West buildings (from outside) to use the entrances on Constitution Avenue. Click above to download a flyer to hang in your office or cube. There are new threats to the important, hard work you do every day at the EPA. NTEU is here to serve as your advocate through uncertainty. Now we must stand together. 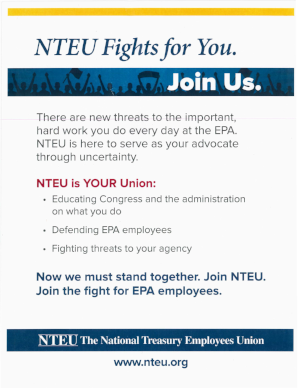 Join NTEU and Join the fight for EPA employees. Click the image at the right to download a flyer with this message. Hang it in your cube or office, in your break room, and on community bulletin boards around the office. Why is NTEU Suing OPM? Members periodically inquire about why NTEU is suing the U.S. Office of Personnel Management over the massive data breach, thought to be perpetrated by Chinese hackers. The lawsuit was filed to protect members’ constitutional right to informational privacy, which OPM violated by failing to properly secure the records, despite numerous warnings about security deficiencies from OPM’s inspector general. How bad was the problem and what did OPM know and conceal? A House Committee on Oversight and Government Reform report, "accuses OPM of misleading the public and Congress about the breaches to play down the fallout — criticizing the agency for its claims that the two cyber attacks were not connected and not proactively announcing the first breach when it was uncovered in 2014," according to The Washington Post. The article also notes that the problem was imminently preventable, noting that "numerous inspector general reports ... raised the alarm about the agency's digital security before the hacks," according to The Post. Among other relief requested by NTEU in its lawsuit, NTEU wants the court to order OPM to provide lifetime credit monitoring and identity theft protection for any NTEU member affected by the cyber attacks and to take corrective measures to improve its information technology security. Lifetime credit monitoring is the least the government should do for this instance of gross OPM negligence. We all devote our lives to protecting human health and the environment, so we should be able to expect that the Office of Personnel management is protecting our information, and if they aren't, that they take care of protecting us after the breach. But OPM doesn't want to protect you. Rather than OPM stepping up and doing what's right and providing long-term credit monitoring, OPM is seeking to dismiss the NTEU lawsuit. Oral argument on the OPM Motion to Dismiss is scheduled oral argument for Oct. 27. More on the NTEU lawsuit here. We wanted to mention a couple of cool changes to the NTEU Chapter 280 website that we recently activated. At the top of the home page, for example, you'll note a new news panel that shows you the most recent posts from our news blog. In addition to the first three most recent posts, the panel will rotate automatically through the most recent 15 or so posts, three posts at a time. This saves you time, letting you quickly see what's new, and allowing you to only click the stories you're interested in. In addition to the home page news panel, we also have a news sidebar that sits next to each article you're viewing. This side bar allows you to move directly from one story that interests you to another without needing to go back to the main news listing. We've had a Twitter feed for a while. But you've had to navigate to our Twitter page to view our posts or subscribe through your favorite Twitter app. Now you can visit the home page and scroll to the bottom. You'll see the most recent tweets of the Chapter right on our website. If you have any other suggestions to make the website more useful to you, or to provide story ideas, please make them using our Contact page. It's all politics all the time lately in the media. As a fed, we have some restrictions on what we can and cannot do at work and at home when it comes to political activity. We want to keep you out of hot water, particularly since the Hatch Act's only authorized penalty is removal from your job as a fed. The FERS retirement system is fully funded and financially sound with no unfunded liability. Today, FERS is frequently pointed to as a model by a diverse group of pension experts for its three-legged stool structure (defined benefit, defined contribution, and Social Security), and by workforce experts for meeting workers’ job portability needs. Federal employees contribute a portion of their pay toward their retirement to achieve an average FERS pension of approximately $1500 per month, a modest retirement income.